* RACHEL HOTT PH.D. , Co-founder of the NLP Center of New York shares her insights gained from over 30 years in the field as she talks with Jim Swingle about living, learning and Training NLP in the centre of New York City. * KRIS HALLBOM Reveals the Universal Cycles of Change and explains how virtually everything is influenced by these continuing stages. She offers some great tips on noticing where you are in the cycle, and what you can do to maximise your opportunities. * LYNN TIMPANY shares her personal trials and success from the learning curve that challenged her in helping children to find happiness. Her story is a candid one that comes from the heart of desiring to make the world a better place for all who are ready and willing. I’m sure you will find her tips very useful. * DAVID GORDON takes you through an insightful h=journey on the road to discovering the structure of experience. 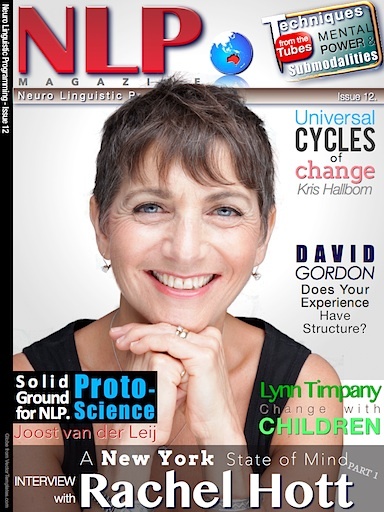 This article comes from his extensive online material on modelling – the Experiential Array with Graham Dawes and highly recommended reading for anyone interested in the core of NLP. * JOOST van der LEIJ delivers remarkable results from an often over-looked vane of science called Protoscience. With a few years of data already amassed and more institutions coming online to add to the pool, the findings not only show good news for NLP, but the Subjective Bayeonism approach being used is said to be a solid model of science. If so, this could be a game-changer, not only for institutions that have been waiting for sings of an “official green light”, but also for the field of NLP to provide quality professional services. Stay tuned! * ANDY SMITH, STEVE ANDREAS, and the NLPwiki contribute to this section on one of the defining aspects of NLP – SUBMODALITIES. Yes, while they are indeed all in your mind, understanding the practical possibilities of controlling the power of your mental images is nothing short of a paradigm shift in a world where the illusion of blame is not only an expected social meme, but a mechanism for lawful profiteering from the disempowered. Learning about submodalities should be in every school classroom. 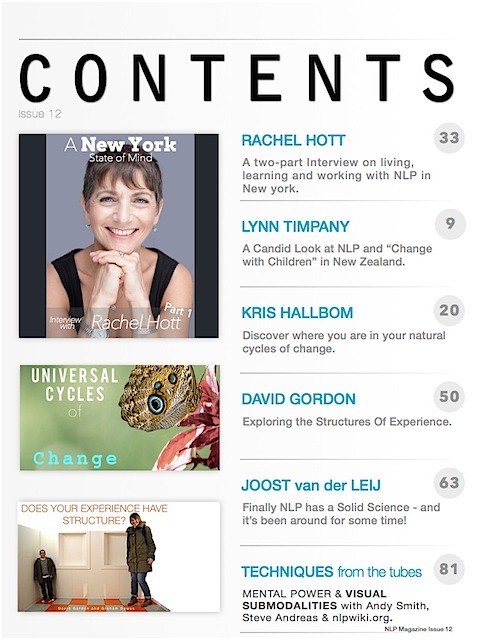 This entry was posted in Magazine Editions and tagged Andy Smith, David Gordon, Hott, Joost van der Leij, Kris Hallbom, Lynn Timpany, NLP and kids, NLP Magazine, NLP new york, NLP science, Pete Tarca, Rachel, Steve Andreas. Bookmark the permalink.